Another shot of it working. Note the green color lamp. It has a bit of a story time behind it. Here I go again with my stories. So basically, I went onto a search journey. I wanted to find out if there are still manufacturers to this day that make this colored transparent lacquer for coloring lamps in it to retro them. after a long and painstaking process of stalking various companies and manufacturers and blogs on internet and countless trips in my city looking all over art and convenient and home centers, hoping to find little bottles of precious and rare lacquer. But no luck. I was devastated, and about to give up when my ingenuity paid a visit in my mind warehouse. I thought to my self: "Maybe there are colored transparent lacquer just for glass?" I went into my nearest art store, and they had 16 FREAKIN' DIFFERENT COLOR BOTTLES OF LIQUID GLASS LACQUER. I decided to buy one and try it. It was love at first sight. I went ahead and I bought all 16 bottles, each 3 euros. The lacquer when dry has the same texture and same shinyness as the USSR made one! My dreams became a reality, I can now throw away all permanent sharpies and just simply dip the lamps in a colored transparent lacquer and create a reliable and more strong color film on the glass, exactly the same way they did in soviet lamp factories - they dipped the lamps in tubs of this precious lacquer. Nice to still find this laquer. 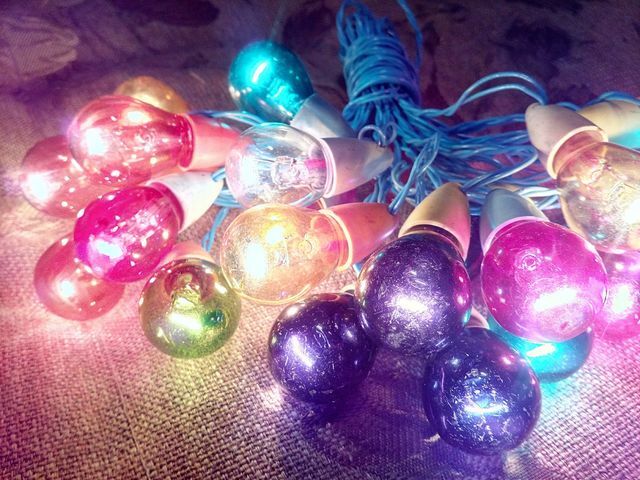 It may be OK for small decoration lamps, but normally the ordinary lacquers are based on acrylate polymers which do not have good heat resistance. Other polymers with longer life were normally used for lamps.